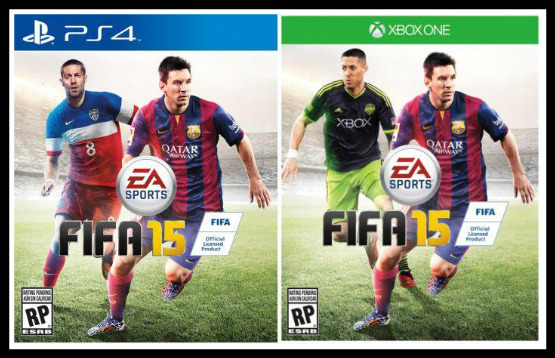 North American gamers will finally see a USA soccer star after 3 years feature on the official EA Sports FIFA 15 cover alongside Argentina and Barcelona superstar Lionel Messi. Keeping up the trend of years gone by, Electronic Arts stated that they’ll be revealing each star to join Messi in their respective territories and country’s over time. The North American cover is the first of many to be unveiled in the weeks ahead. Last year Manchester United and Mexico striker Javier Hernández joined Messi, but now it’s been taken over by Dempsey for this years installment. Dempsey will be in his United States Of America kit for the Sony PlayStation 4 and PS3 version, and in his Seattle Sounders FC kit for the Xbox One and Xbox 360 cover version as seen above. The news came to light as Tottenham Hotspurs played the Seattle Sounders in a pre-season friendly. The last time a US football player featured on a FIFA front cover was back with FIFA 12, when Landon Donovan joined England and Man Utd striker Wayne Rooney. Dempsey who’s now 31 years of age has earned his way to the FIFA 15 cover due to his impressive performances in the 2014 World Cup with the USA, and basically being their best player in their entire team. FIFA 2015 will be packed with loads of brand new visuals and you can check out all the latest news regarding the upcoming footie simulator by clicking on our tag or category pages to find more content to read and watch stunning videos in super HD.